A shop itself is simply a list of items, weapons and armors that are sold in the shop. How the shop is displayed in the game is handled by a Shop Layout. Shops can belong to a faction – if that’s the case, the faction’s buy and sell price modifiers are used. This way you can give discounts to the player when he earns a faction’s trust (i.e. gains sympathy and reaches a better faction benefit). Also, a shop can optionally override the price an item is sold for. The quantity of items sold in the shop can optionally be limited. Additionally, a shop can keep the items the player sold to it, allowing to buy them back. The kept items can be either kept while the game is running, or in a save game (this is set up in the Save Game Menu settings). Shops are created in World > Shops. A shop layout works similar to a Menu Screen. It decides how a shop’s items and equipment are being displayed. By separating a shops content and it’s layout, you can use the same layout for multiple shops, without the need to recreate it every single time. E.g. 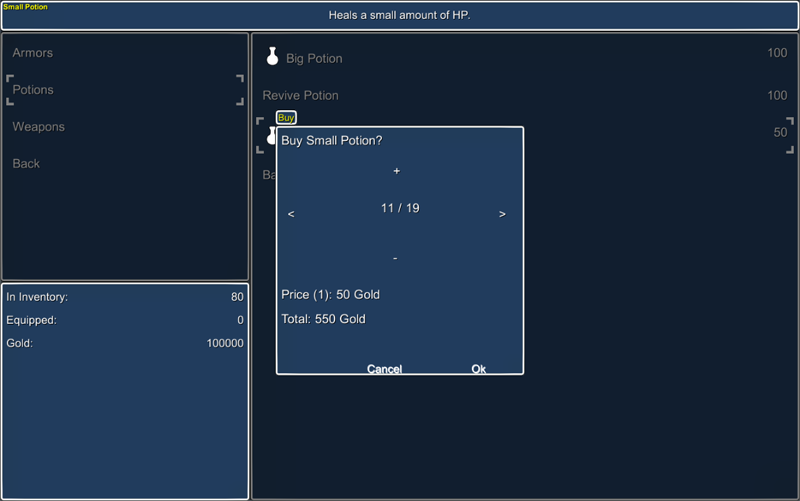 you can set up different layouts for different kinds of shop, like weapon dealers and potion shops. In contrast to menu screens, the different parts of a shop layout are already predefined and can optionally be enabled/disabled. The name box will display the name (or general info about the shop), the buy/sell box will allow the player to chose between buying and selling, the type box and list box display the available item types and items/equipment. Additionally, the description box will display the description of selected menu choices (e.g. the description of an item), the info box can display general information (e.g. the money or quantity of an item in the player’s inventory) and the combatant info box displays information about player group members (e.g. how their status values will be changed by an equipment). Shop layouts are created in World > Shop Layouts. The shop interaction uses a Scene ID to keep track of items sold to the shop and the quantity of sold items (when using quantity limits). Also, the optional faction of the shop is defined in the shop interaction. Game variable conditions can be used to make a shop available only at certain occasions in a game. You can also open a shop using Game Events. This is done using an Open Shop step (can be found in the Function Steps). The Open Shop step has two next slots – one if the player bought something in the shop, one if he didn’t.